Fifteen years ago this week, NASA’s Opportunity rover touched down on Mars. Now, officials are acknowledging that the rover could be permanently out of commission due to a dust storm that knocked it out of communication with Earth in the summer of 2018. When Opportunity landed in 2004, it was only expected to last for 90 days. Instead, it powered through an extraordinary 5,111 — nearly a decade and a half of exploration on another world. The spunky rover added appreciably to scientists’ understanding of the Red Planet, was immortalized by XKCD, and took an iconic selfie. Its “immense scientific legacy” helped NASA plan the follow-up Curiosity rover mission. 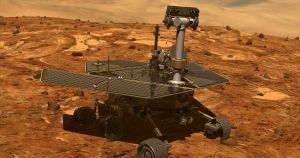 But six months ago, Opportunity found itself in the middle of a dust storm that the Times called “one of the most ferocious storms on Mars in decades” — which blocked its solar panels and it may have proven to be too much for the tiny rover to overcome. “That’s an honorable death,” Squyres told the Times.